It is rare for a new animal species to emerge fast enough to be documented in real time, but this appears to be going on in eastern North America with what some are calling the coywolf. As America developed wolves in the northeastern U.S. began to rapidly lose habitat. When faced with the pressures of a scarcity of potential sexual partners, wolf populations in southern Ontario began breeding with dogs and coyotes. 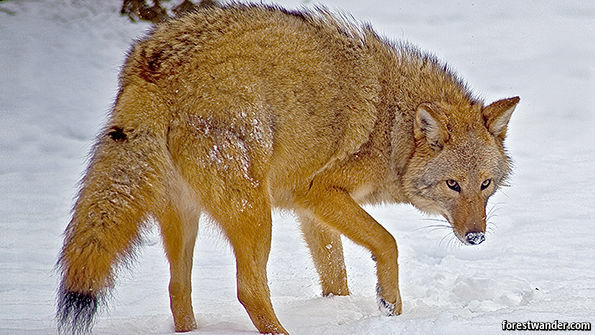 The coyotes were a breeding option because of the same pressure on the wolf population. Clearing land enabled coyotes to spread from prairies into former wooded areas. Human population also brought with it the dogs that also became part of the genetic mix. This interbreeding has now led to an hybrid that is better suited to its environment. Coyotes are not well adapted to hunting in forests, wolves are, dogs. The interbreeding produced an animal skilled adaptation in both open terrain and densely wooded areas. Interestingly the cries of the hybrid have components of both the wolf and the coyote.